(Corvus corax) These sleek, black birds are excellent and acrobatic fliers on par with falcons and hawks. They are very intelligent and sometimes cooperate to flush out prey when hunting. What does the Raven eat? Ravens are omnivores. They feed on fruits, seeds, nuts, fish, carrion, small animals, food remains and garbage; just about anything! Approximately 13 to 17 years in the wild and about 30 in captivity. How many ravens can be born at a time? The females lay three to seven eggs each spring. Both parents care for their young, which remain dependent for several months. These sleek, black birds are excellent and acrobatic fliers on par with falcons and hawks. These intelligent birds were honored by Native Americans and often portrayed as sly pranksters for their playful nature. They are very intelligent and sometimes cooperate to flush out prey when hunting. According to legend, if the ravens leave the Tower of London, the fortress and the British kingdom will fall. Bubba – Our oldest raven who came to us in 1995 as a baby. Since he was so young, he ended up imprinting and could not be released. Bubba can untie shoelaces, is excellent at talking and mimicking, and is also a great problem solver. 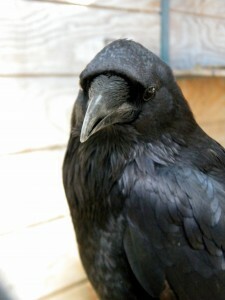 Gump – is a female raven that lives with Bubba, she came to us in 2007. She was found on the ground with a broken wing. Her wing never healed completely so she cannot fly, but she and Bubba get along very well. George – found in 2015 and brought to the zoo from a Southern California rehab facility. Wild ravens often stop by to visit our ravens. They often bring treats for our ravens that they like to share. Our ravens return the favor by passing special morsels of their food back out to the wild ravens.